So I received my license less than a week ago and right now I am carrying a Kimber Micro Carry .380 in a DeSantis Inside Heat. I carry in the 5 o'clock position and I've learned a few things pretty quickly. 1. I need new grips. The stock rubber grips eat at you pretty quickly. 2. I now wear an undershirt all the time. I'm not sure if that will change when I get new grips. 3. I wear my pants a bit higher now. I never wore them low, but even so I found the barrel/holster would dig into me so I i brought them up an inch or so. It's not bad at all. The biggest thing is the grips I think. Are checkered rosewood very aggressive? I like those on my other firearms but I'm not sure how they feel for carrying. Or should I just go with some smooth and slim grips? Any other tips would be greatly appreciated. Re: Tips for IWB comfort? I have the inside heat as well and I've found that I don't use it too much, I typically favor my alien gear holster. My carry pistol is polymer, so I've usually got that digging at me. I do agree with you that an undershirt makes things much more comfortable, however on the weekends when I'm not dressed for work I usually forego the undershirt and deal with it because it's hot as sin right now. Come October this will probably change and I'll be in undershirts all of the time. What belt are you using? I've found that a true gun belt will make a huger difference. 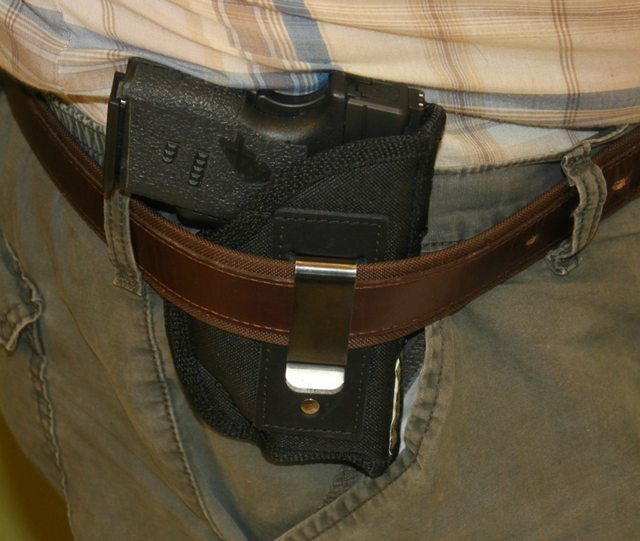 Regular belts would just sag after a day or two and never give my holster good support, and just made for a very uncomfortable day. Oh, and welcome to the club! I have carried IWB since day one in 2004, either a Glock 17, 19, 22 or 21. I cannot emphasize the undershirt thing enough. You have to keep that grip from direct contact with your skin. A nice grippy texture is crucial under stress, if you hands are sweaty, or heaven forbid, bloody... you need that grip texture. Do not get rid of it. The new Gen 4 glocks with the new rough texture are a joy to shoot, but harsh on your skin. Some good quality undershirts are a must, and I am not talking about thin, ribbed, wife beater types. Other than that... the key is to realize that carrying a pistol is meant to be comforting, not comfortable. Believe it or not, the discomfort eventually goes away and you hardly notice it. It does take longer than a week to get used to, though. 30.06 signs only make criminals and terrorists safer. I use the Inside Heat holster as well. I carry a Springfield XDS 9. However, I carry at 3 o'clock. Have you tried carrying it in different positions? I was lucky... it only took me 2 holsters to find the best for me... I know others have had to go through many more. No matter what you choose, make sure it is comfortable for you. I have carried everyday since getting my license, and honestly most of the time I don't feel the gun at all...its that comfortable for me. AJSully421 wrote: I have carried IWB since day one in 2004, either a Glock 17, 19, 22 or 21. I cannot emphasize the undershirt thing enough. You have to keep that grip from direct contact with your skin. A nice grippy texture is crucial under stress, if you hands are sweaty, or heaven forbid, bloody... you need that grip texture. Do not get rid of it. The new Gen 4 glocks with the new rough texture are a joy to shoot, but harsh on your skin. Some good quality undershirts are a must, and I am not talking about thin, ribbed, wife beater types. This is very true. My undershirts are Stafford brand from JC Penny, good thick ones. I've tried the 3 o'clock position but the grip safety and hammer seemed to dig into me in that position. 5 o'clock feels pretty good except for the grip but I'd imagine that would happen anywhere. I did notice that some of my older and more worn out undershirts don't protect as well as my newer ones. The discomfort isn't really bad. My first night on my Wally Walk was the worst. My grip rubbed my skin raw in less than an hour. But since then it has been mostly small tweaks I've been making. Rwgarding grips, you guys are right I still want enough texture that in a tense situation I can grasp it easily, but I didn't know if there were recommendations for grips that will maintain my grasp while still not being as abrasive. G10 perhaps? I've only ever used rubber and wood grips so I dont have much experience there. I'm thinking about it! I thought it would be harder to conceal but the last couple of hours I have been wearing my Springfield XD 45 in the OWB plastic holster that came with it and it conceals pretty well. I have a Colt Defender on layaway that I plan on making my EDC. If I can easily conceal the CD OWB the Defender shouldnt be a problem. My other concern for OWB is that my only form of transportation is a motorcycle. I feel more comfortable having the firearm closer to my body IWB while I ride. I have concealed a shield, CCO 1911 and Commander 1911 in an OWB with just a t-shirt and I only wear the size that fits - I don't buy a size larger. Some shirts print while others are very inconspicuous. However, you could look at some form of retention. For OC, I just have a thumb break. But you could go with something like Safariland ALS for CC and motorcycle riding. That holster does look good. I think I'm going to have to do some holster research. For now ill continue wearing my Springfield OWB and Kimber IWB. I'll get an idea of what I will get used to as I carry more, what my wardrobe works with and which I like more. I really like the OWB though. TexasJohnBoy wrote: I have the inside heat as well and I've found that I don't use it too much, I typically favor my alien gear holster. My carry pistol is polymer, so I've usually got that digging at me. I do agree with you that an undershirt makes things much more comfortable, however on the weekends when I'm not dressed for work I usually forego the undershirt and deal with it because it's hot as sin right now. Come October this will probably change and I'll be in undershirts all of the time. 'drag' a little on the skin when I sweat. for something that small, look at Kusiak Leather. it will carry nice and low, it might be more comfortable for you. I am just starting to IWB carry and I think that the Galco Royal Guard (Gen 2) is very comfortable. It's pricy but comfortable. As for gun belts, I don't see how you can find a better one than the Alien Gear brand. I have been wearing one for two weeks and think that is top notch. Crossbreed is very comfortable to me. Along with a BELTMAN belt.